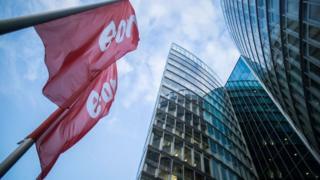 Energy supplier E.On has become the first major company to announce price rises in response to a new cap set by the regulator for the start of April. On Thursday, Ofgem said it would allow suppliers to charge more to those on default tariffs owing to a rise in wholesale costs. Now E.On has confirmed it will put up its prices by 10% for 1.8 million customers. Other members of the so-called big six suppliers are expected to follow suit. More than half of British households are likely to see the cost of energy rise by a similar amount in April. This would mean a rise of £117 for those with typical energy usage on a default – or variable – tariff. Ofgem sets maximum prices that can be charged for gas and electricity to those who have not switched suppliers. It sets the cap for households in England, Wales and Scotland. Northern Ireland has a separate energy regulator and its own price cap. Ofgem said that, from April, suppliers could cover the higher costs they face on the wholesale market by raising prices. About 11 million households are on default, or standard variable tariffs, and are set to be affected. Another four million on prepayment meters will also see prices rise, typically by more than £100. E.On has become the first to announce an increase for its customers in April, saying that it is moving in line with Ofgem’s extra allowance for suppliers. “Over the coming weeks we’ll be writing to affected customers explaining what the changes will mean for them and encouraging them to choose the best tariff for their needs,” an E.On spokeswoman said. All the major suppliers set their standard variable tariffs at, or very close to, the current price cap, so they are expected to follow suit in time for the new cap taking effect in April. Ofgem points out that, without the existence of the cap, households would have been paying more, according to its research.